For the first time in history, a feature film created by a university film program will release in movie theaters nationwide. “Extraordinary,” produced by the Liberty University Cinematic Arts, Zaki Gordon Center and Working Title Agency, will release in more than 400 select theaters nationwide, including in Lynchburg, Va., for a one-night premiere through Fathom Events on Thursday, Sept. 7, at 7 p.m. in all time zones. Based on the real-life experiences of acclaimed ultra-marathoner and longtime Liberty professor David Horton, “Extraordinary” stars Shari Rigby (“October Baby”), Leland Klassen (“Altar Egos”), Karen Abercrombie (“War Room”), and Kirk Cameron (“Fireproof”). 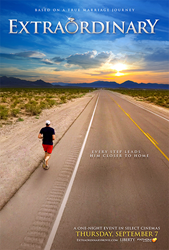 The film follows Horton as his dream of tackling a nearly 3,000-mile run takes its toll on his body and brings his marriage to the breaking point. Liberty University’s Cinematic Arts Department will celebrate “Extraordinary” with a red-carpet event Thursday, Sept. 7, at 5:30 p.m., at the Regal River Ridge Stadium 14 in Lynchburg. Moviegoers can walk the red carpet, pose for photos with actors, and enjoy a pre-show at 6:30 p.m. The film’s cast will be in attendance. Immediately following the feature content, Fathom Events will present a panel discussion, including the filmmakers, “Extraordinary” stars, and host Tim Clinton of the American Association of Christian Counselors to discuss the importance of maintaining a healthy marriage, along with practical ways to improve relationships. As Horton’s marriage was tested during his grueling run, the panel will explore the impact that following your dreams can have on those closest to you. Tickets for ‘Extraordinary’ can be purchased online by visiting ExtraordinaryMovie.com or at participating theater box offices. For a complete list of theater locations, visit the Fathom Events website. For artwork/photos related to the film, visit ExtraordinaryMovie.com. Synopsis: The seemingly endless road beckons. Well beyond exhausted, his body trudges onward — quitting is never an option. Aiming toward the finish line of another transcontinental race, he senses his prize this time is much greater than any medal or honor. Every step leads him closer to home. Based on a true marriage journey, “Extraordinary” tells the amazing story of ultra-marathon runner and college professor David Horton, his wife, Nancy, and their attempt to finish their marriage race well. “Extraordinary” was created and produced by Liberty University’s film program. Fathom Events is recognized as the leading domestic distributor of event cinema with participating affiliate theaters in all 100 of the top Designated Market Areas®, and ranks as one of the largest overall distributors of content to movie theaters. Fathom Events offers a variety of one-of-a-kind entertainment events such as live, high-definition performances of the Metropolitan Opera, dance and theatre productions like the Bolshoi Ballet and National Theatre Live, sporting events like “Canelo Álvarez vs. Julio César Chávez, Jr.,” concerts with artists like Michael Bublé, Rush and Mötley Crüe, the yearlong TCM Big Screen Classics film series, inspirational events such as To Joey With Love and Facing Darkness, and anime titles such as Princess Mononoke and Spirited Away. Fathom Events takes audiences behind the scenes and offers unique extras including audience Q&As, backstage footage and interviews with cast and crew, creating the ultimate VIP experience. Fathom Events’ live digital broadcast network (“DBN”) is the largest cinema broadcast network in North America, bringing live and pre-recorded events to 897 locations and 1,387 screens in 181 DMAs. For more information, visit fathomevents.com.